Princeton Junction, NJ, February 09, 2018 --(PR.com)-- AVANTE International Technology has developed a series of patented and patent-pending systems which are cost effective in implementation and do not interfere with daily train/track operations, while providing additional rail safety. AVANTE’s Switch-Point Monitoring System engineered to provide supplementary and independent monitoring of switch point positions to the central command and oncoming trains within 5-10 Km. - The quantitative switch point closure data with built in redundant contactless sensors (absolute closure or measurable gap sensing) is transmitted wirelessly in real-time to central command and also designed to broadcast to oncoming trains with a special display and alerting console. - These sensors solve both the wrong switch position problem and the improper closing or malfunctioning switch point problem. - Just as important to advanced technology, AVANTE’s Switch-Point Monitoring System is designed to be mounted and installed onto each switch point within 30 minutes without drilling or other invasive methods which may affect integrity and disrupt normal train operations for an extended period of time. AVANTE’s Rail Visibility System solution is designed to provide real-time imaging visibility of rail crossings and curving rail sections to provide advanced visibility to engineers. - Digital imaging video cameras are installed and broadcast real-time images of crossing areas to oncoming trains within operational areas and distance. - Alerts will be sounded within the engineer’s cab, when there are parked vehicles or other obstructions in the train’s path for any extended period of time. - The same digital/video image system is designed to provide a view of the rail ahead, and from around the curve of the rail to train drivers to provide similar visibility as if the train is on a straight track providing adequate time for the train driver to react if the situation is required. AVANTE International Technology, headquartered in Princeton Junction, NJ with over 20 years of innovations in providing system security and safety protection for facilities, assets and people. AVANTE’s patented positive train control system (US 9,434,397; and other pending patents) are designed to cost effectively achieve train operation safety. AVANTE's Switch-Point Monitoring System engineered to provide supplementary and independent monitoring of switch point positions to the central command and oncoming trains within 5-10 Km. 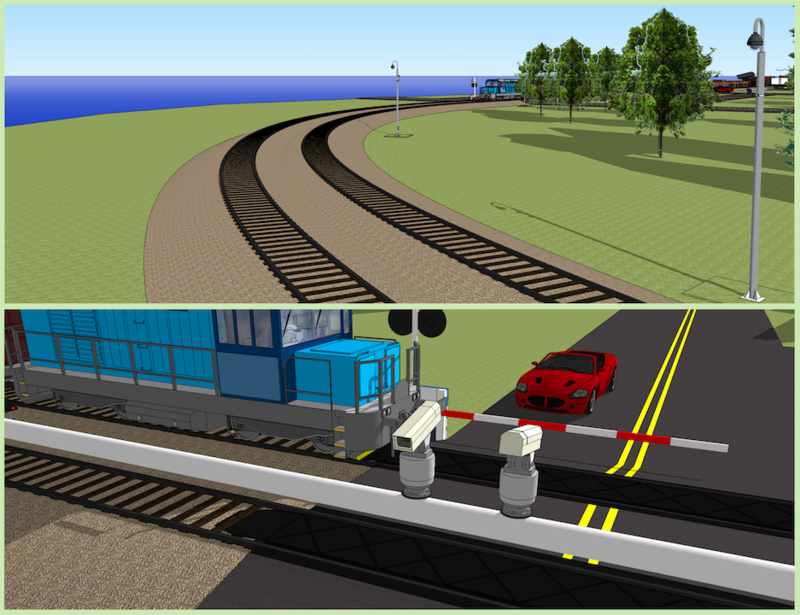 AVANTE's Rail Visibility System solution is designed to provide real-time imaging visibility of rail crossings and curving rail sections to provide advanced visibility to engineers.